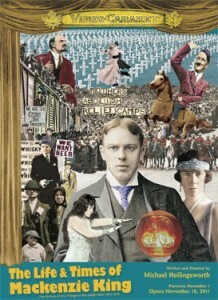 The Life and Times of Mackenzie King begins with the end of World War I, and ends with the beginning of World War II – a zeppelin-ride through the soaring twenties and the diving thirties with Canada’s longest-running Prime Minister. As the grandson of the notorious rebel William Lyon Mackenzie, King was driven by a sense of destiny and spurred by ghostly outriders. He fell in love regularly but never married, preferring the companionship of other men’s wives, and seances with his late mother and other great departed souls. King’s occult companion Mrs. Joan Patteson, beloved dog Pat, political foes Prime Ministers Meighen and Bennett, contemporaries James Shaver Woodsworth and Samuel Bronfman, are joined in the play by Joe and Vince, a couple of Great War veterans who find employment in the rum-running business, and Molly, a war widow with nothing left to lose. Vince rolls it all on the gal and the hooch, while Joe never stops fighting whatever is fighting him – union-busters, gangsters, mortgage-holders, work-camp bosses.